A corpse lies in state in a ruin of a mill in a desert town of the Sasanian empire. Discovered by troops in pursuit of their king, Shah Yazdgerd III, the body, arrayed in the habiliments of the shah, including his gleaming face-mask, with a bag of treasures nearby, has clearly been murdered. The miller (James Udom), his wife (Francesca Fernandez McKenzie), and their teenage daughter (Sohina Sidhu) are accused of the shah’s assassination by a commander (Sean Boyce Johnson), a captain (Curtis Williams), and a priest (Setareki Wainiqolo). The three commoners plead for their lives, asserting their innocence, and regale their captors with numerous variations on a tale of how the man died. Meanwhile, a soldier (José Espinosa) prepares a gibbet upon which to hang the guilty miller. 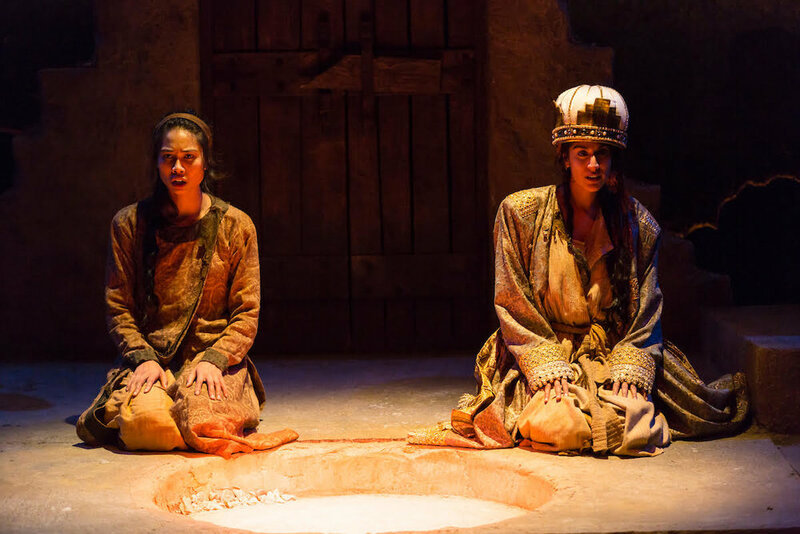 Death of Yazdgerd by Bahram Beyzai, translated from Persian by Manuchehr Anvar, has been given a stunning thesis production by Shadi Ghaheri in the Yale School of Drama. The play is cunning in both its drama and its humor, involving the viewer in an exfoliating story that seems to have no end. By acting out stories, the miller and his family keep their punishment at bay while leading their questioners through a thicket of doubts and revelations. The production uses a variety of techniques to transport viewers into an ancient world that is full of portents and suggestion. Muralist Iman Raad has created, as backdrop, a tapestry-like drawing that depicts all the main events of the story, and projection designer Yaara Bar uses animation and projection and lighting to make elements of the mural come alive in response to narrative details. The effect, often ghostly or magical, conjures the ancient Iranian storytelling method in which a Naqqal (or storyteller) would act out his story in front of a tapestry, pointing to the relevant visuals as he went along. Significant as well to the production’s aura is the way music accompanies much of the narrated drama. Live musicians Yahya Alkhasana and composer Mohsen Namjoo create textures of sound that enhance and punctuate the text and add an eerie overlay that makes the entire play feel mythic, even ritualistic. And that’s key, too. We are watching a trial, at times, but we are also watching a funerary rite as the priest prays over the body, and we are watching oneiromancy, as the woman at one point enacts a dream of the shah’s that the priest is eager to interpret. At another point, the girl raises the shah from the dead by giving his corpse a voice. And all the while, as the stories become more and more revealing of the tensions among the miller’s family, and of issues such as whether or not the miller tried to protect his daughter’s chastity and whether the shah seduced the woman, the soldier keeps breaking in with updates on gibbet-building and prisoner-interrogating, and the three inquirers find themselves more and more befuddled. They are unable to arrive at a clear story—as the play goes on, the miller, woman and girl move from denying they knew that the man, dressed as a beggar, was the shah, to nearly convincing their interrogators that the body is in fact not the shah, but the miller. Which gives the miller the role of being the shah in hiding. The switching of identity has to do not only with the fact that no one has dared to look upon the shah up close, but also with Beyzai’s insistence that class differences cannot be used to adjudicate truth in these matters. The miller and his family are so skilled in storytelling that they can make their listeners believe almost anything. Confusion among the family seems to flow from their own failure to decide what they believe and to stick to it. They enact a fascinating and theatrical sort of stream-of-consciousness where any interpretation immediately gains a voice and presentation. The ensemble’s work with the play’s stylized speech and grand manners is thoroughly enthralling. Sean Boyce Johnson gives us a sober commander who knows too well his own failings of judgment and so wants to be fair. Setareki Wainiqolo’s priest is the most learned, but also the one most willing to accept, or even to expect, uncanny elements to play a part in the death of the shah. As a sort of foil, Curtis Williams is the captain who discovered the body and who wants to defer to the other two, if only their judgment makes sense. All three look their parts well thanks to Mika Eubank’s glorious costumes. All three actors playing the miller’s family are superlative. Their roles call for quick-changes in voice, demeanor and emotional tone, sometimes even interrupting a key moment in the narrating monologue with an aside out of character to one of the others. 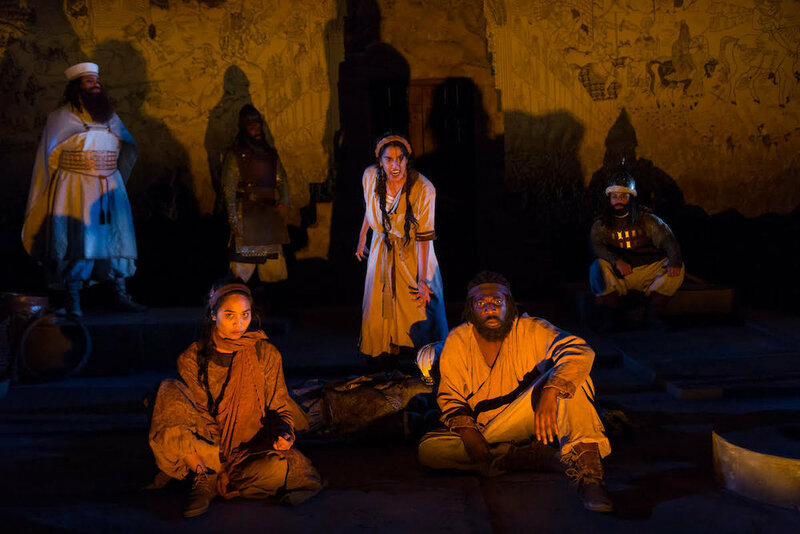 Sohina Sidhu plays the girl as, initially, giddy and childlike, but as the play goes on she becomes a strong force, accusing her mother and mourning her father. James Udom’s miller has the sturdy gravitas of a man facing a death sentence and trying to be convincing. He is able to enact his murder of the shah and deny it in the next breath. It’s in many ways an unfathomable role and Udom masters it. Then there’s Francesca Fernandez McKenzie as the woman, a role that comes to dominate, not only because the woman is fierce in upbraiding her husband and daughter and the interrogators, but because she enacts a kind of sorcery of storytelling. McKenzie’s intensity is unflagging as she turns the tables several times, speaking with the authority of mercurial emotions, and, during one particularly balletic enactment, behind the shah’s gold mask. Aided by John Bondi-Ernoehazy’s impressive circular set, with atmospheric lighting effects by Samuel Kwan Chi Chan, director Ghaheri has created a memorable production of an enigmatic play—both gripping and entertaining—that might be considered an elaborate shaggy dog story about an era-changing historical event. We get any number of possibilities about how the dead man met his fate, and a few possibilities about his identity. In a sense, the entire play is only a diversion to delay or defeat the verdict of death for the miller and his family: an exercise in storytelling as a matter of life and death. In the end, the enemy army—which Yazdgerd was apparently fleeing—overruns the shah’s troops, and to the victors go the spoils.